As with audio takes, you can record multiple MIDI takes to build a perfect take. Building a final composite take from multiple takes is called comping. To create a take folder when recording in cycle mode, you must first choose Record→MIDI Recording Options→Create Take Folders. The MIDI recording options will set how your project behaves when you create overlapping MIDI regions. 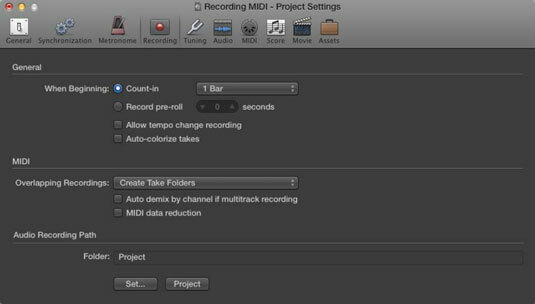 You can get to the MIDI recording options also by choosing File→Project Settings→Recording. Then select how your project handles overlapping MIDI regions on the drop-down menu. 1In the cycle ruler at the top of the tracks area, drag from left to right to set the cycle locators. Cycle mode is automatically turned on and represented by a yellow strip in the ruler. 2Press R to begin recording. After the second take is recorded, a take folder is created, and new lanes are added with each pass through the cycle. All previous takes are muted so you hear only the current take. 3Press the spacebar to end recording. Click the disclosure triangle in the upper-left corner of the take folder. The take folder will open and display all the takes. You can open the take folder also by double-clicking it or by selecting it and pressing Control-F.